This week's freebie is another one for butterfly fans. And who doesn't love gorgeous butterflies? 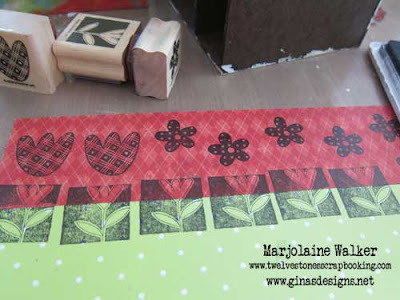 This printable is great for cards, ATCs, and layouts. 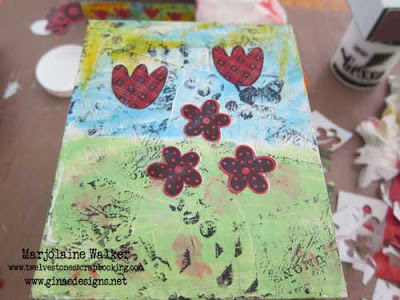 Christine created a card today using a part of the printable. 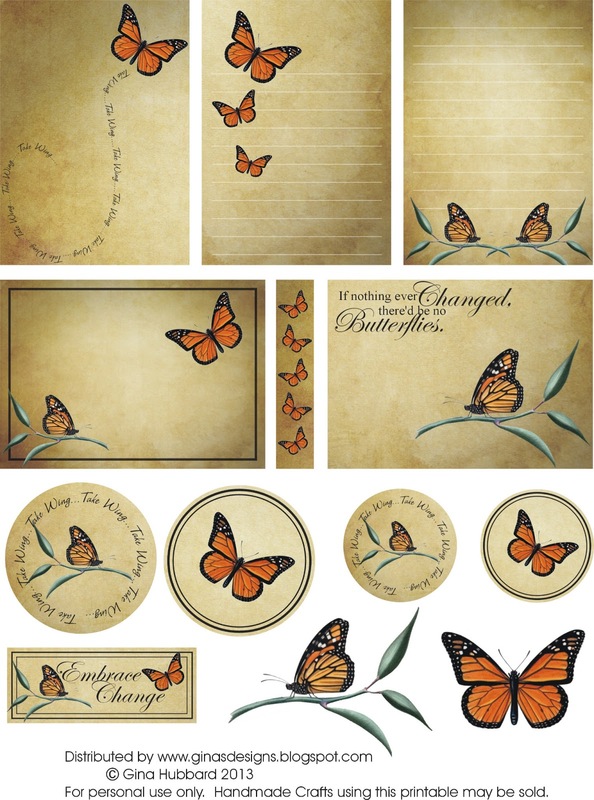 Don't you just love these beautiful butterflies!?! She backed one of our doilies from the cardstock doily set 1 for just the right elegant touch! 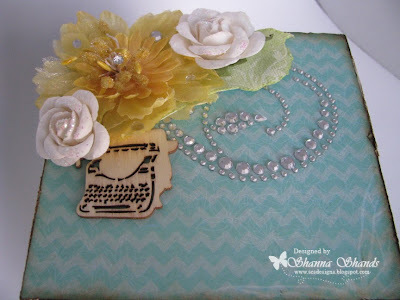 It's Wednesday and it's Nancy blogging with you today! This layout features my cat "Timothy" who loves bird-watching from the wire enclosure outside his window. This is one of the many outdoor enclosures we had built for the enjoyment of our multi-cat family and to keep them safe from harms way. 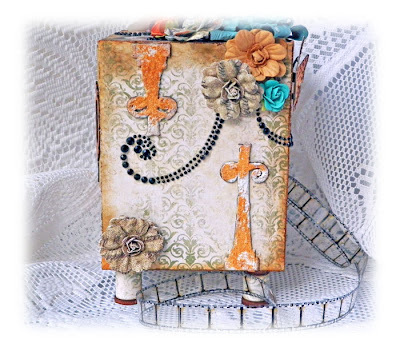 I used tons of chipboard embellishments from Gina's Designs on this one, including many of our newer items in the store. 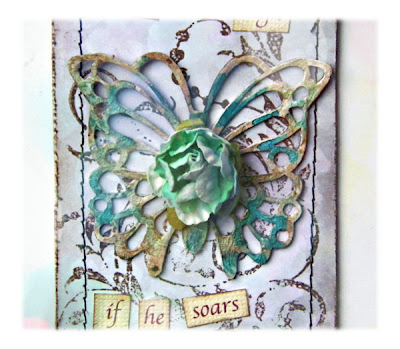 My inspiration for this layout in both design and color comes from the very talented Charlotte aka Suepup sketch 0513. Hello everyone it is Heidi with my mini album display box! 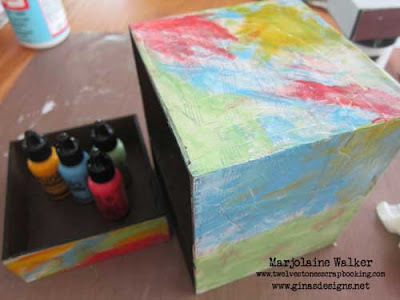 This is a cute, fun and easy project. Honestly, it only took a couple hours to complete all of this so do not be intimidated. 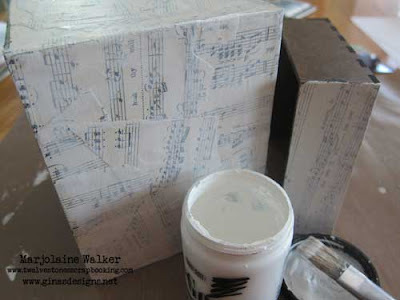 It comes with supplies to make 4 albums (as you will see I have made 2 of them). 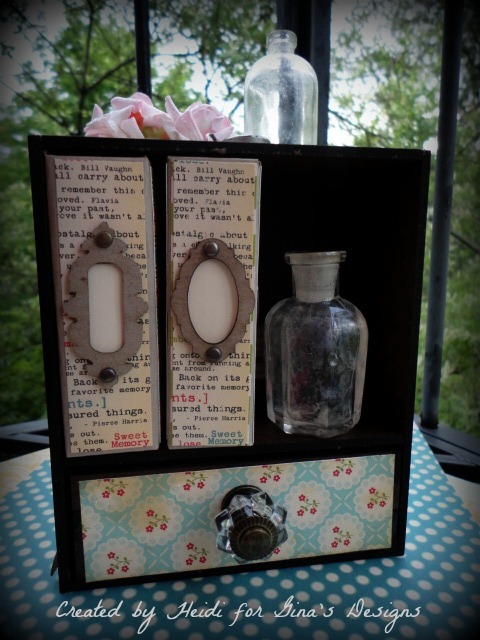 Is this little drawer not the cutest? I lined mine with one of the little doilies and filled it with vintage charms. 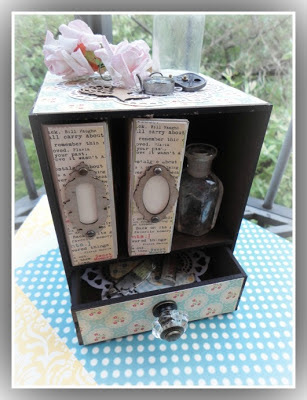 The little know is Tim Holtz of course, I love so many of his items with these Off the Page items. One can never ever have enough of these fabulous doilies!!! 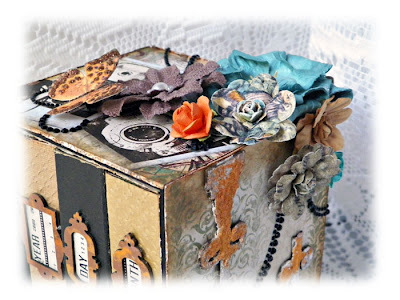 I decided to lightly decorate the sides of the display box with some distress ink and dressforms. Here are the little albums that I put together and decorated. 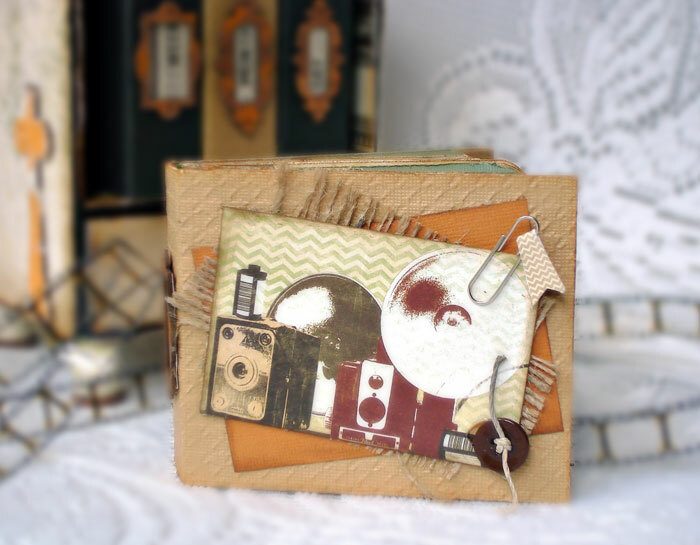 The albums are little accordian style so you have the chipboard album and then you can add pages. 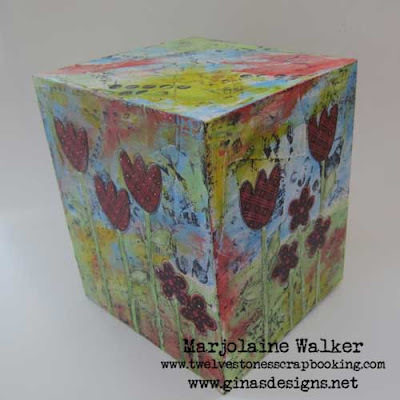 I do hope you enjoy this project as much as I have- it really is a little treasure to keep or give away! Hi Gina's Designs Readers! 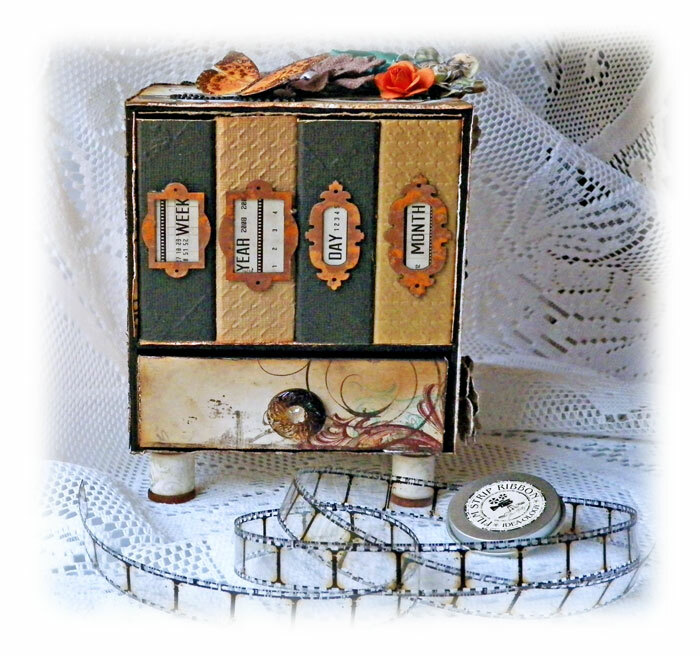 Kathi visiting with you today and sharing my Mini Album Display Case. I used Graphic 45 papers from several of the collections and used Recollection Bling/Ivory Pearls . Are you enjoying seeing the variety of Mini Album Display cases? 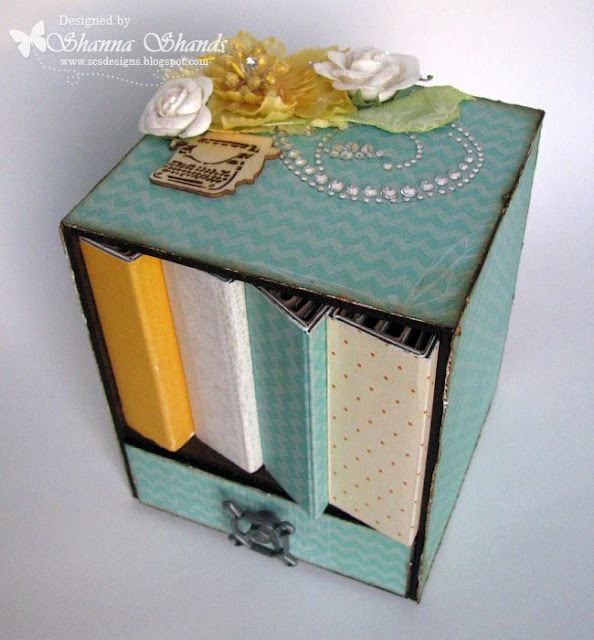 Shanna, up today with my Mini Album Display case. 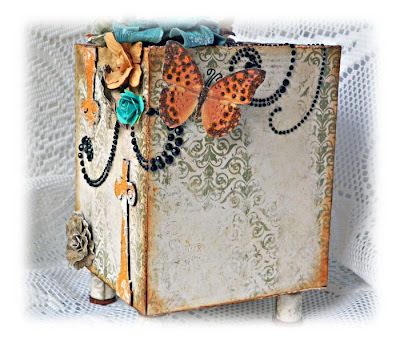 I decorated mine with Prima Ladybird collection, Prima embellishments and some bling. This week we are featuring a printable for our friends who are doing a "Project Life" style book. 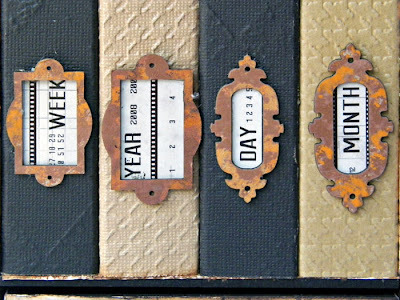 These cards are perfect for journaling the everyday happenings or highlighting a special occasion. Hi Everyone! It's Lisa here today and I am sharing my mini album display case. I had such a great time creating this project and I know you will too! This beautiful piece Gina designed houses four little mini albums. 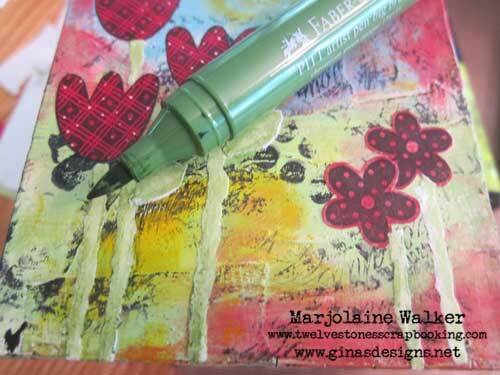 I covered mine in Bo Bunny Mama Razzi Papers and inked all the edges. 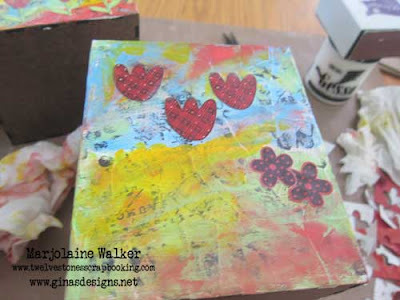 Gina's Miniature Bookplates Shapes gave the binders of my mini albums a special touch. I dabbed Tim Holtz distress paints on the chipboard bookplates in two different colors. 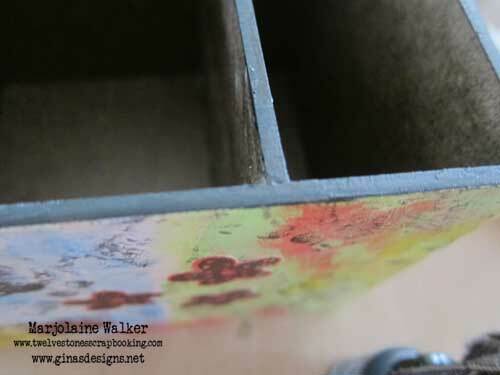 I added a button for my drawer pull and covered wooden spools in matching paper for my feet. The top of my case was covered in flowers and butterflies! I used Gina's Hinge Straps on the sides of the box. I covered them in modeling paste and then went over them with gesso. 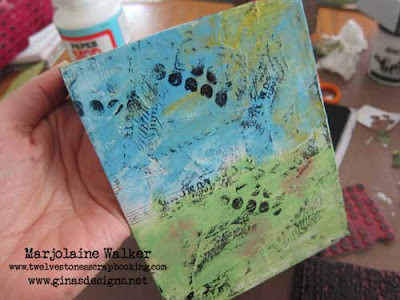 While the gesso was set I sprinkled on distress embossing powder and heat set it. This is the back of the display case with a sweet butterfly and some bling! Here is a photo of one of the little minis! Isn't it too cute! I hope you enjoyed my project and don't forget to stop by the shop and pick up one of these cases for yourself! 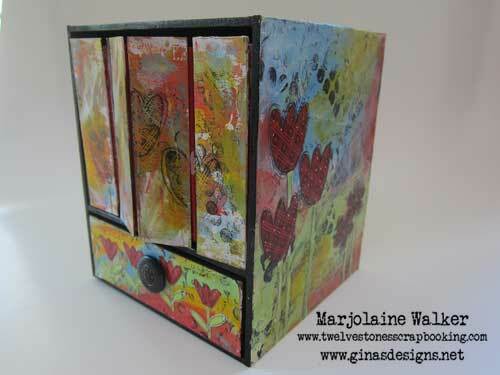 Marjolaine here today with my mini album display case from Gina's Designs. 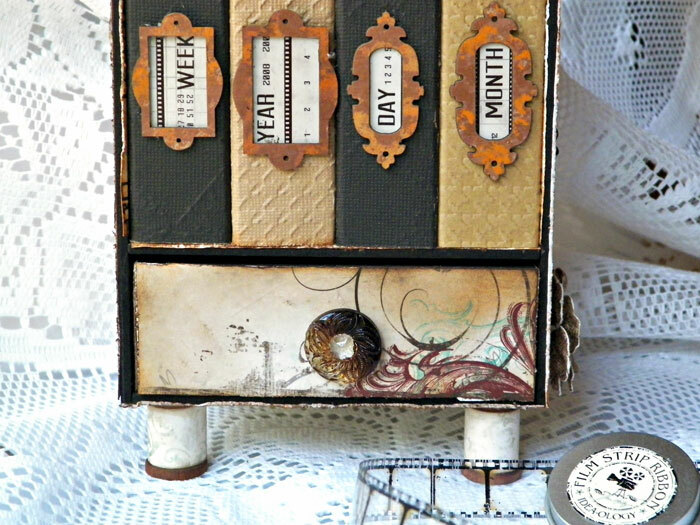 Since I was itching for a little mixed media I decided to paint my display case and albums but I'm thinking that it would also be fun to alter this piece with scrapbooking paper. 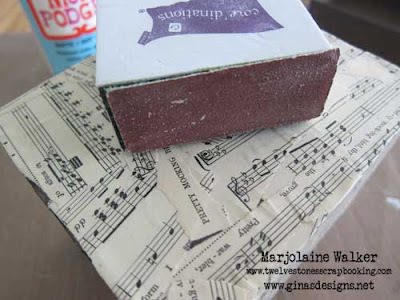 I started off by covering the surfaces with music sheets and Mod Podge. I sanded some of the rougher edges. 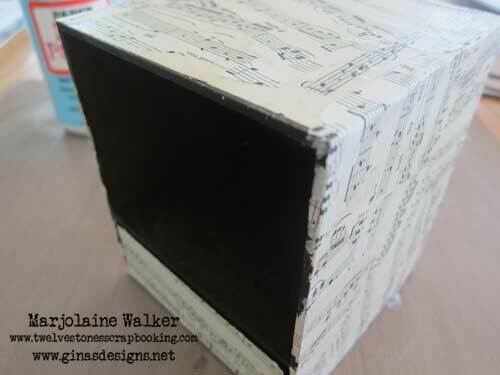 Covered the whole thing with gesso. Added some bold colors of paint. Stamped on some scraps of paper. Added some texture by randomly stamping all over the case. 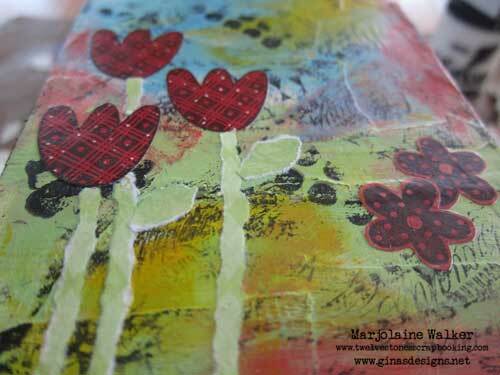 Adhered my flowers with Mod Podge. Ripped some stems and leaves out of scraps of paper. Outlined my stems and leaves with a green Big Brush Marker. 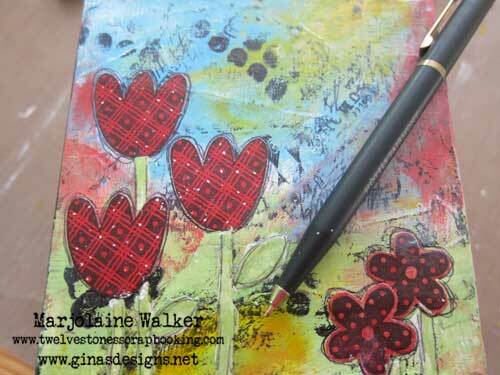 And Outlined all my flowers with a black pen. I did much of the same on the albums but I haven't finished the inside yet. That will have to be for another day! 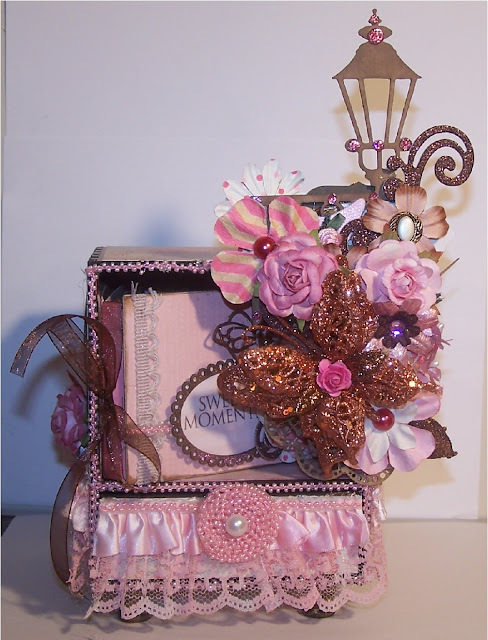 Hello everyone, Rashida with you today and I’m posting my Mini Album Display case from Gina’s Designs. 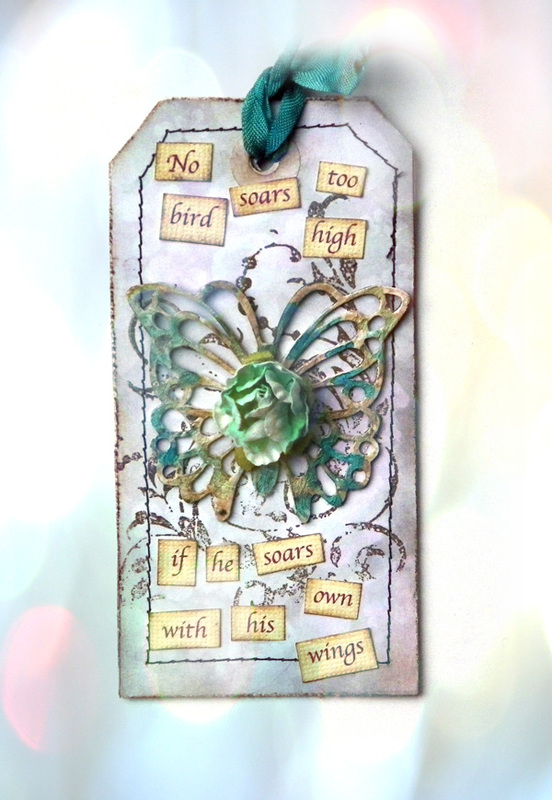 I embellished it using Cardstock Doily Set Intricates, Lamppost, Butterflies & Dragonflies, and filigree frames. I created a butterfly mini album and I am sharing the cover and a tag from it today along with a tutorial on how to treat the chipboard with Lindy's and Crackle Mediums. 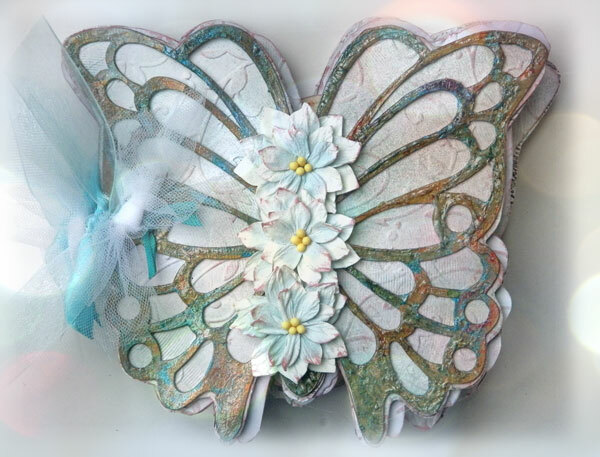 The cover of the album was treated with the technique shown in the video as was the butterfly on the tag! The tag was stitched on the outside and stamped. I printed the words on my computer and after printing I cut each word and inked the edges. 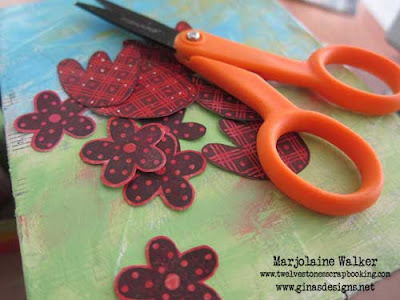 Flowers were added to the center of the album and the tag for an extra special touch! Freebie Friday - Let's Play A Game! Here's a printable that would be great to use on ATC's or Family Game Night layouts. Kathi up today to share another one of Gina's fabulous ATC Shrines. I had a lot of fun creating this ATC shrine using Tim Holtz, & Graphic 45 to really amp up the steampunk feel. 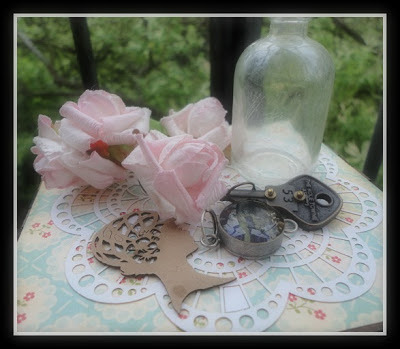 I used Distress Crackle Paint, on the hot air balloons, the gears, & the propellers. Don't you just love all the details that are on this shrine?